8. What is different if I have a tiny house on wheels? 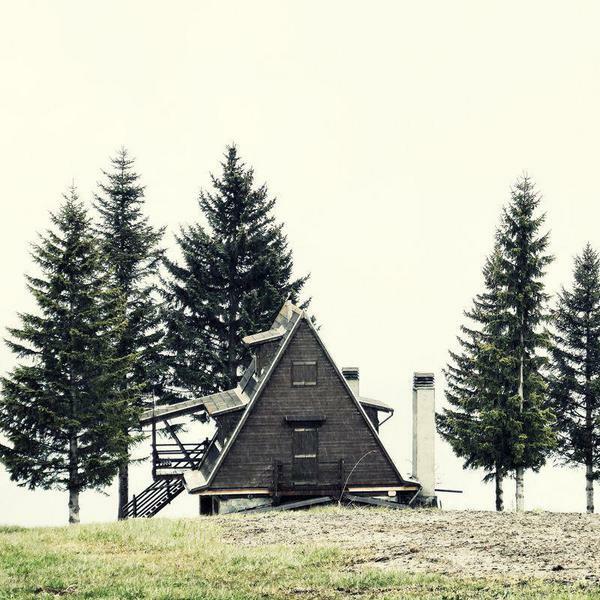 Living in a tiny house might be your dream or you are already building one but did you ever wonder how are you going to fit everything you need in such a tiny space? But the good news is as I started my own research I got to know that there are genius ideas to maximize tiny house storage space. As much as the satisfaction of living in a tiny home, a lot of open room should be available to make it breathable inside the rooms. People have come up with all sorts of ideas from moveable walls, doors and windows to furniture and vertical construction. At the end of this article you can get an organized set of ideas about what you can do with your storage space in your kitchen, bathroom, office and lots more. Let’s start with the kitchen since it is the root to all delicious foods made at home. Kitchens can become messy, be it 500 square feet or 50 square feet. Some of these ideas can help decrease the clutter and create smart storage in the kitchen. Most tiny houses are made with lots of cabinet covering the walls and making them useful. If you intend to use cabinets all over your tiny home and the kitchen then you can use the side of the cabinets to put shelves on them. Check it out on Country Living. This will give additional space to keep hot food. You can even use it to grow spice plants like rosemary, basil or mint. If you are thinking of using the side of the cabinets to fit some shelves, there is another idea you can use also. This idea can make you think “why didn’t I think of that before?”. We put everything on the shelf, but the surface below is always wasted. 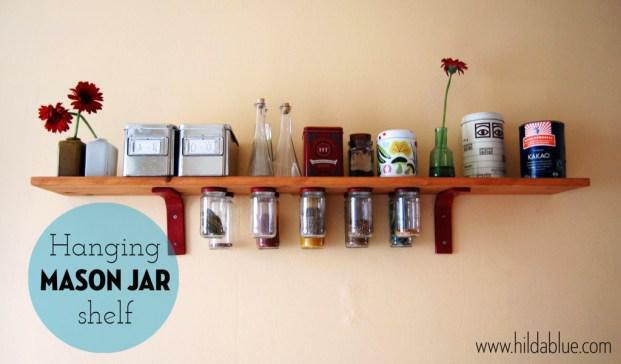 This hanging mason jar shelf idea on Hildalblue has created a lot of interests. It’s a worth a try! One of the concepts that really made me baffled was this overhead open shelf in the kitchen. This is a good way to get rid of some of the cabinets and make space for other furniture. The concept is very simple. The cabinet stays over the stove. 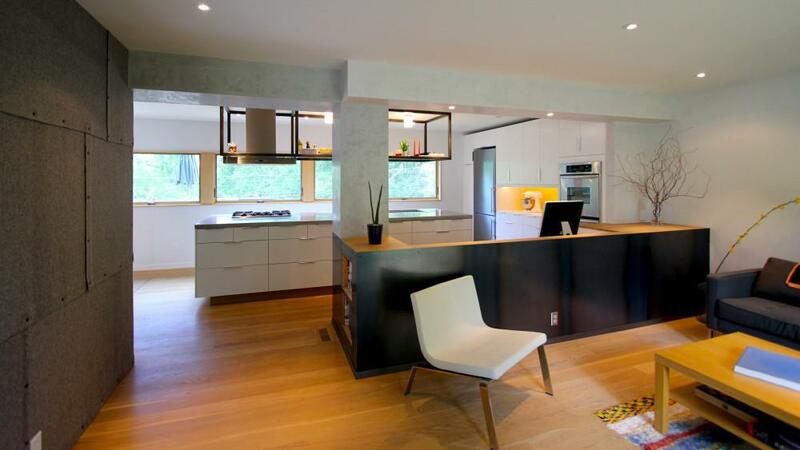 It is built by wide open cubes that also provide a sense of openness in the kitchen. Genius isn’t it? Office storage in tiny home? 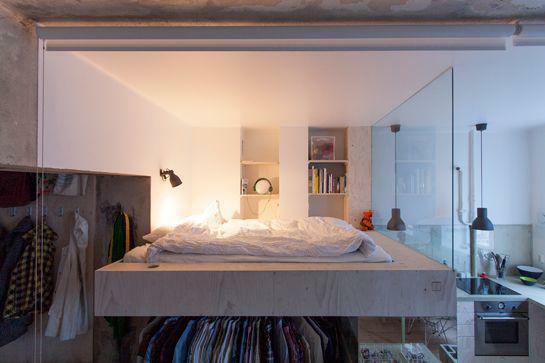 I can’t even imagine having space for a bed in it! When the word office comes to mind what do we usually think? We think of a big, spacious room with furniture and computers. But in fact a tiny house space can be managed in such a way that an office room can feel spacious and effective. Let’s look at some of these ideas. These shelves are put on together vertically to create a contemporary storage unit. 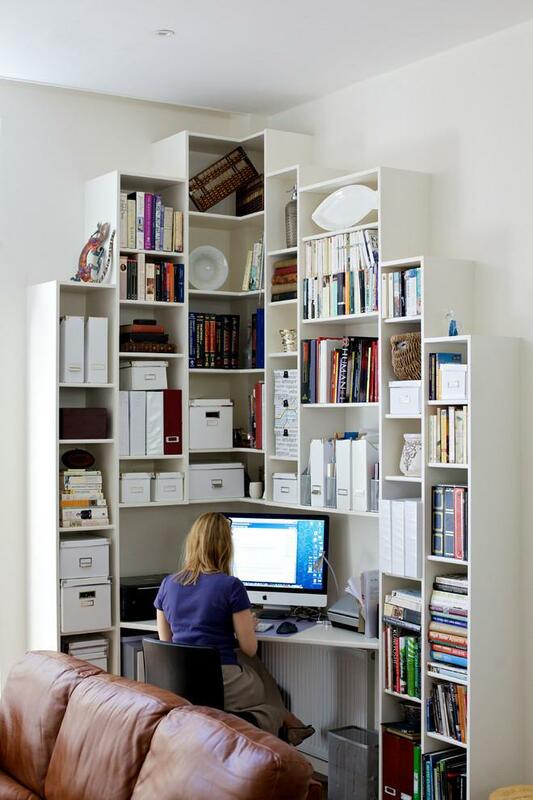 It can be used as an office space and just about anything necessary can be put on the shelves. 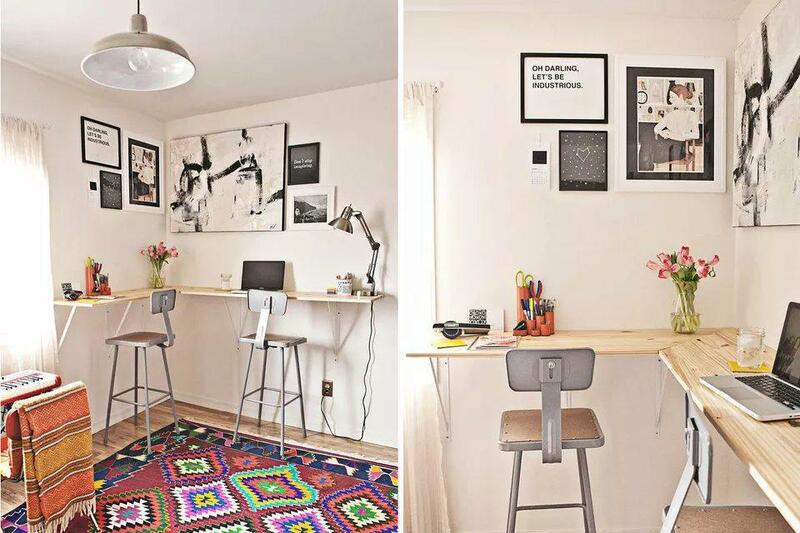 If you have a room where you want to set up office, this is the perfect way to divide the room without wasting space. The Book shelf will bring life into the room and also add additional storage opportunity. The corners of the walls are always wasted. A useful way to utilize the space in tiny offices is to wrap a shelf around these corners. And you can use this work station to work standing if your bum aches! It’s DIY corner workstation developed by A Beautiful mess. 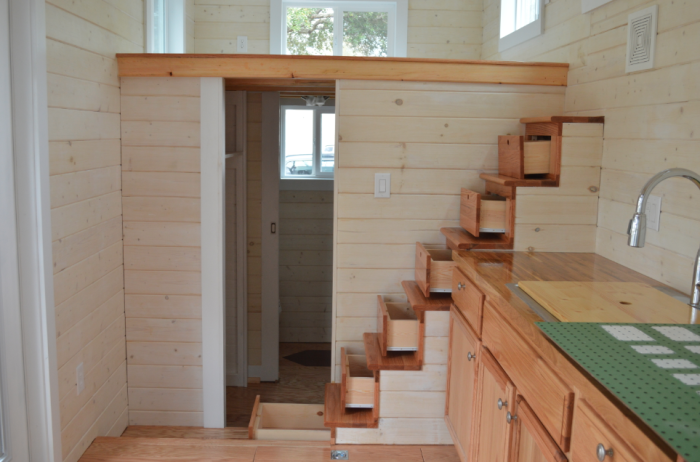 Finding space for a bathroom is difficult in a tiny house. 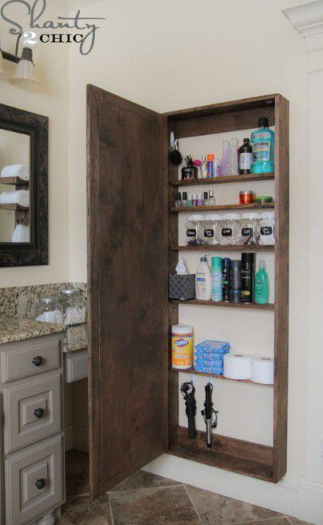 What more amazing is finding storage space in the bathroom. 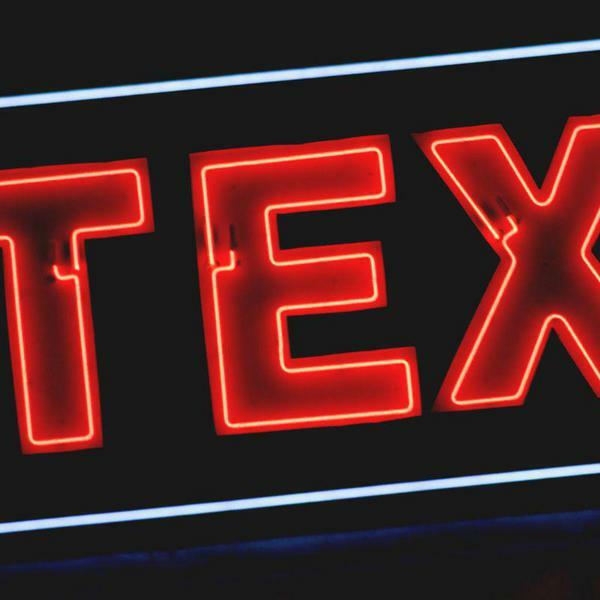 Some of these ideas might help you a great deal. You can put up a shelf right beside the bathtub. This will save space for putting up a shower and storing bathroom accessories. What more do you want in your bathroom? Mirrors are common to use in bathrooms. 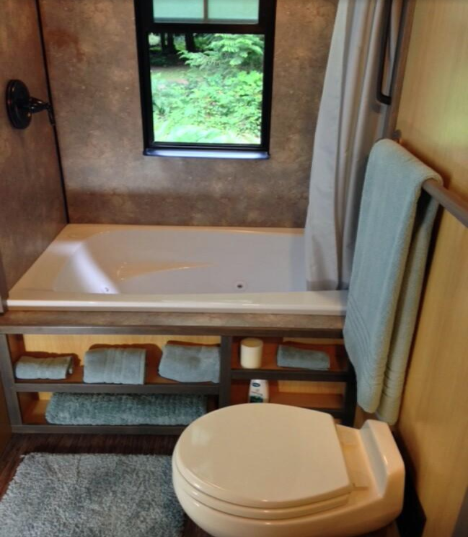 In tiny house bathrooms, findings space for it is almost impossible. 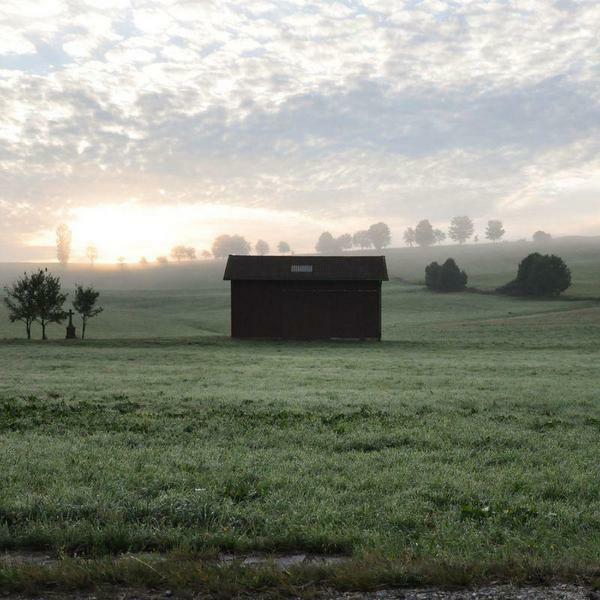 This concept is a must try for aspiring tiny house owners. When it comes to bedroom most things are stored in it. As a tiny house owner you should be able to create space so that you can make space for more things. Let’s quickly have a look! This is one of my most favourite bedroom storage ideas. Windows and doors can consume quite a lot of space in your bedroom but you can say it goodbye and cover it all up by closets and cupboards. This you can do only if you consider building custom furniture that is built around a window. Brilliant! Total space usage opportunity! Folded beds are not at all new but most people forget how easily this can be used to save space and make storage. 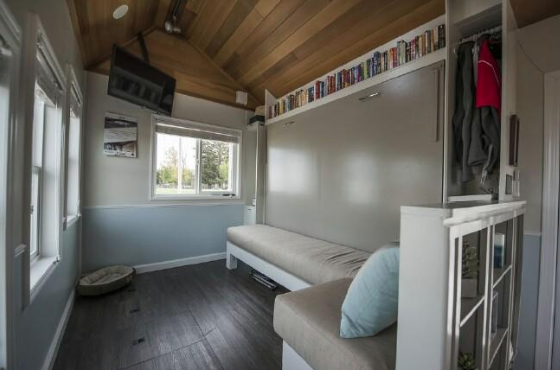 High shelves in tiny house bedrooms can be used to store books and other staffs. Add to this a folding bed, you have plenty of room now. 3. 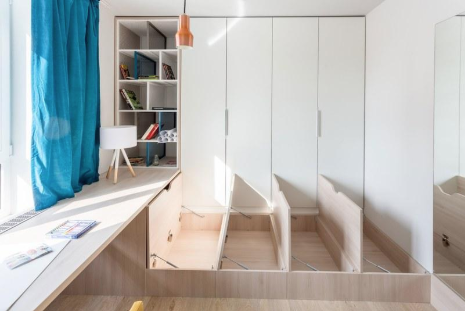 Hidden drawers conceal enormous space! Tiny house storage can be tricky but fun. You can take pride of completely using your big double sized bed. 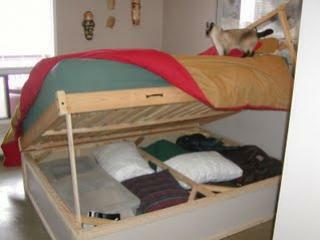 you just have to customize your bed and make few sliding drawers underneath. Congratulations! Now your entire bed is a storage unit! Too much shelves in the living room can hamper both the aesthetic as well as space of your room. The ultimate storage solution here is turn your couch into a mini storage unit by implementing sliding drawers. Believe me, these drawers can store lots of things, almost eliminating the need for shelf in the entire living room. Need more on couch storage? Here is another idea that you can try. Most of your storage plans must be done before you start building your tiny house. So if you think ahead you can create floor storage units easily all around your living room and your entire home. You can’t imagine how many of them you can make and how much stuffs it can contain. Wait! Stair cases can be made into storage units? What? Yes. Although this is a common storage unit in tiny houses but most people realize after they have built the house. Let’s see what ideas we have. This is personally one of my favourite ideas. You can find this in almost all tiny house blog posts on the internet. 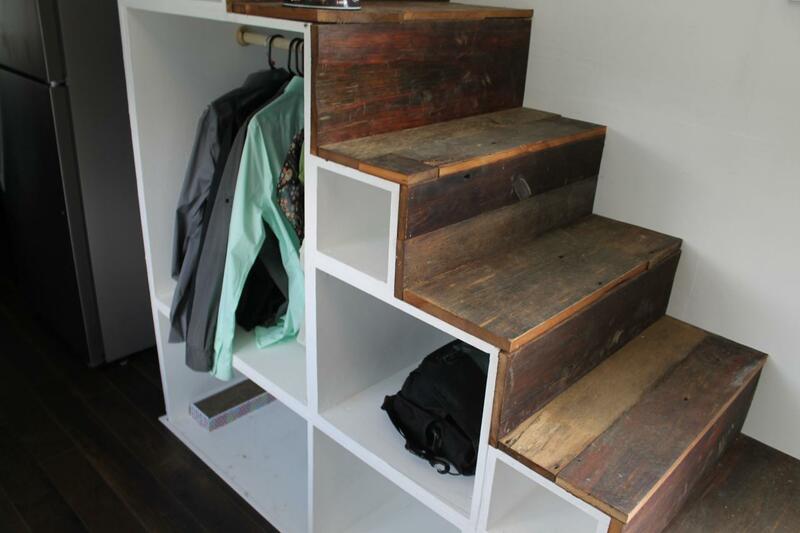 This genius tiny house storage idea implements cabinets under the staircase. You can store everything from books, shoes to cloths. This should be in your checklist when planning about tiny house storage spaces. These staircases look absolutely beautiful and can be even useful in storing toys and shoes below. If you have a child who likes to play with toys, you can keep it at the lowest staircase and his toys will never be lost again! If you open up the sides of your staircase you can even put up a closet inside it. This will save spaces in your bedroom if you have a lot of cloths to hang. Closets are hard to manage in a tiny house but few of these can certainly help you in long run. What is different if I have a tiny house on wheels? 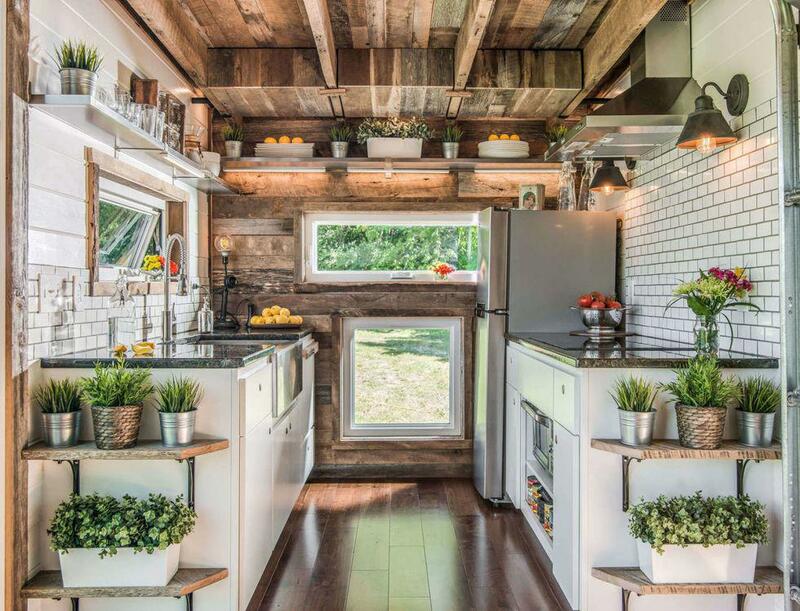 Tiny house on wheels are more like moveable homes. Their major advantage is that it can be custom built in factory as you like it as manufacturers will be able to carry it to the place where you like it to be. The storage system in both on wheels and stationary tiny houses are almost same. But what I think is if you are willing to build a tiny house on wheels you have the opportunity to save more space. This is because you can custom build it right from the beginning. 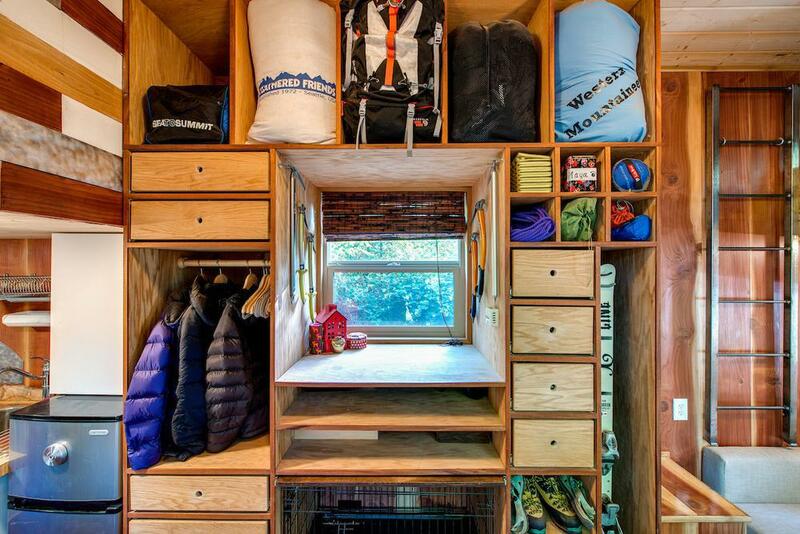 You can implement more innovative ideas for storage in your tiny house on wheels. But in a stationary one, you will not have the luxury of custom made storage spaces. Well, you are in a good place! Put together these ideas I compiled for you and you are ready to have more spaces than you ever thought. Kids loves toys and your tiny house might not have enough spaces to fit all those cute toys in a place. So let’s see how you can fit them! 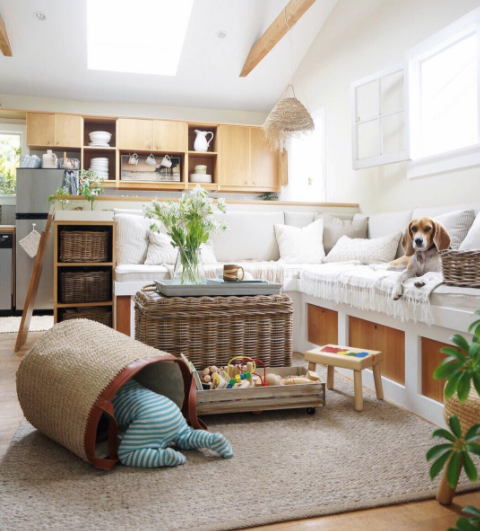 These baskets can be your child’s favourite spot to hide out in your tiny house or it can be his favourite place to search toys. Place few of them with his toys in your home and the little one will never forget his childhood! I have mentioned about the drawers beneath your bed before. But this storage unit can be specially be helpful for your kids to take their toys out and throw them in again. Bedtime play will never be hard again and even for you to put them back in their place. 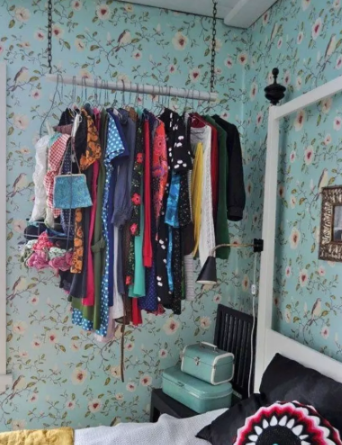 Clothes can be hard to keep in a tiny home. And if you see that there is not much room left for additional clothes to fit in closet then make a hanging closet wherever you want. I recommend hanging them in the bedroom because it will be easier to find them, rather than running to the living room for clothes. If you can put the hanging closet in front of a window it will be much better. Your clothes can take a breath of fresh air after all the sweat and dust when you were outside. Ready for the second idea? I couldn’t find a better image for you but you can clearly get idea of how it works. 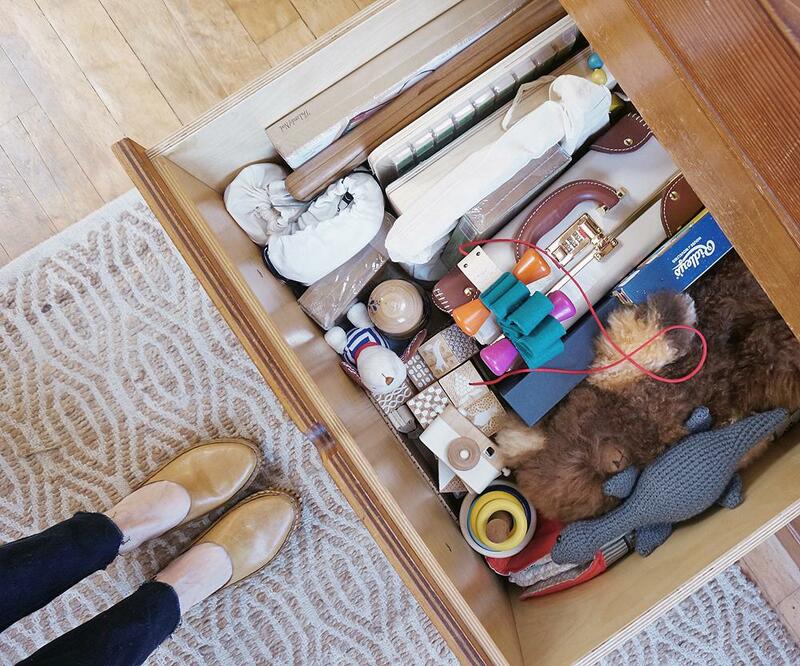 The sliding drawer idea I mentioned earlier is an alternative to this idea. But you can use this to store clothes, blankets and shoes and quite a lot them actually. Even your cat can also enjoy the upside down movement every time you open the under bed storage! Hanging fruit baskets are generally used in kitchen but people like us who own or want to own a tiny home are very clever to make these more efficient. 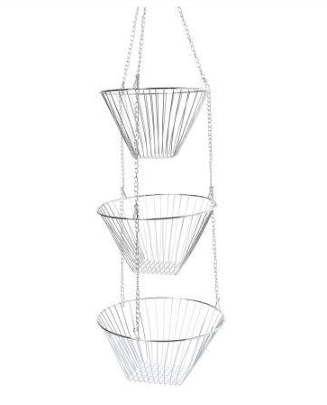 These fruit baskets can hung in the bedroom and Eureka! You can keep cloths, socks, toys, just about anything and they won’t eat up space at all. 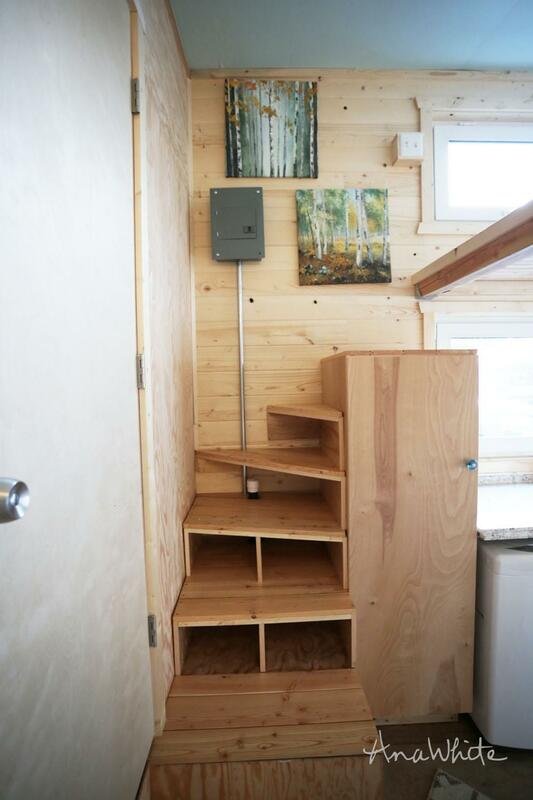 You have got an overall idea about how the tiny house storage works. So, let’s look at some of the furniture that can be used in tiny houses to maximize storage space. 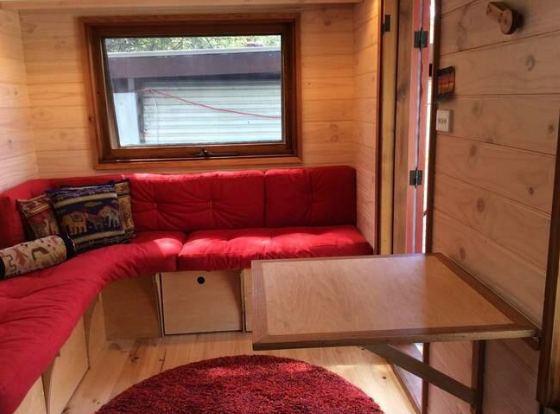 Modular furniture cubes can be one of the best things to buy for your tiny house. Sometimes you might get a call from a friend who is coming in to stay for a few days. But you don’t have anything on which he can sleep. The magic of modular furniture comes here! The modular cubes can be put together to make a bed, couch or anything you like and they don’t consume unnecessary space. Use your ideas and make whatever you like of them and you will not even notice that they exist. Great space saver! 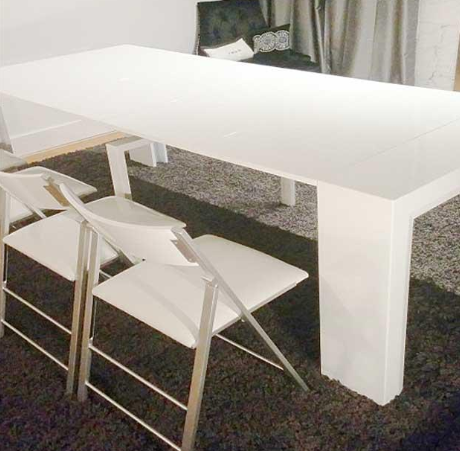 This folding dinner table is the best furniture you can buy for your home. 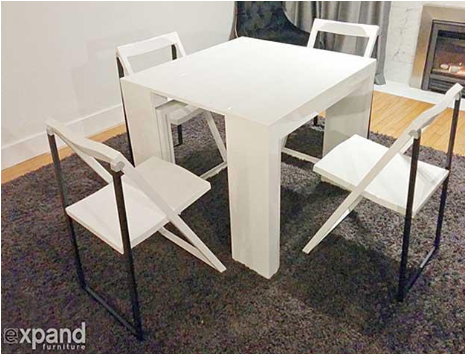 In normal days you and your little family can have lunch and dinner on the small version of the table. And when you want to invite friends and family for a feast you can just make it large for all. Known as trundle bed, this bed can hide below any platform and make up an open space for your kids to play. 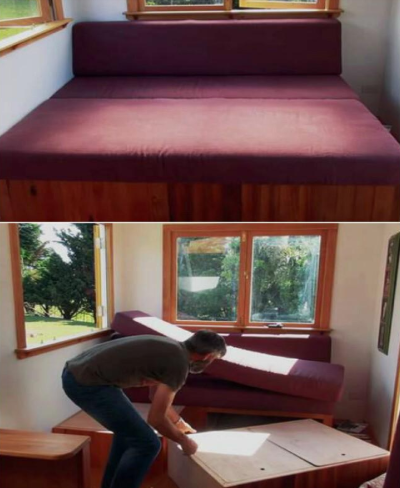 If your bed is lying down all day when it is not necessary, I believe it is killing especially in a tiny house. So, grab one of these, I bet you will not regret! 1. 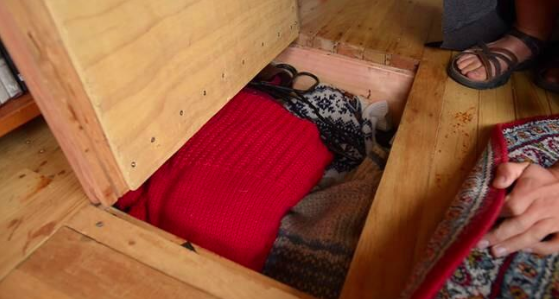 Ever wondered how a closet can fit underneath a bed? This is known as lofted bedroom in tiny house terminology. As the bedroom is placed high above the surface, enough space is made for you to use it as a closet. Just grab a T-shirt and come down from bed! Tada! Cabinets eating up your precious space? Why not make the entire floor with cabinets? This will create room for storing clothes and supplies. Most Tiny house furniture, ceiling or floor are the same you would find in a regular home, but they have different functionalities which creates more storage spaces. So you could use these ideas in a bigger home as well. 3. How about a ceiling shelf? 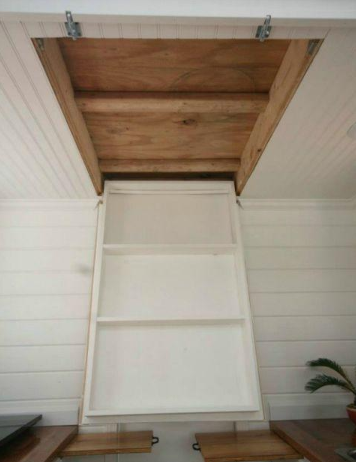 You can easily custom build a shelf in your ceiling. Your floor space will not be used up in this process. The shelf will can be used for storing scrap, laundries and what not! This certainly is innovative and I’m still amazed to see how much ideas you can choose from to save some space in your tiny house! 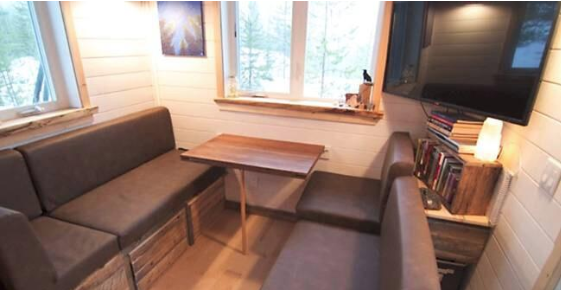 For the obvious question, how to get furniture for tiny house. Truth to be spoken there is no store known as “tiny house furniture” and make your dream come true in moments. Many furniture manufacturers who sells online have some collection of furniture that can meet the needs of a tiny house. When I saw some of them myself, it looked as if they were custom made for tiny house. Expand furniture specializes in multifunctional furniture that can be best buy for your tiny house. Let me tell you that it is pricey but well worth buying as it can save a ton of space in your home! Good news: They ship worldwide, so don’t worry about your location. For a quick review, I recommend have a glance at their wall bed sofas. Searching for websites selling furniture for tiny living, I found home reserve to be very useful. 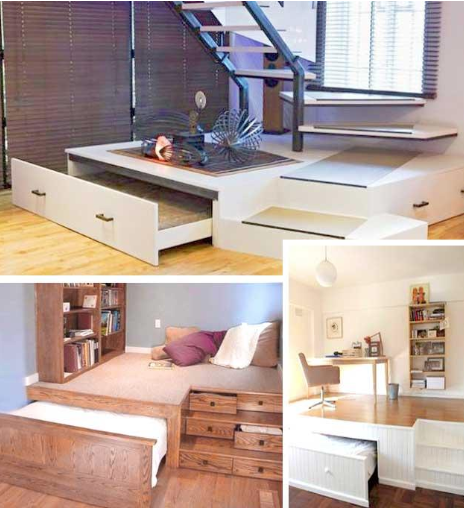 Their furniture is built for extremely small space and small stairs. The assembling and handling becomes easier as the sizes and functionalities are close to perfect for your tiny house. For even more maximizing your storage space, check out resourcefulness. I love their innovative and stylish outlook on furniture. They have marvellous transforming storage furniture that can serve you multiple purpose without killing any space at all. To wrap it up, this piece of article can give you an overall guide for your tiny house storage space ideas. I have covered storage ideas for bedroom, bathroom, living room and kitchen. I have even specifically compiled ideas for storing clothes and toys for your cute kids. The** furniture ideas** will give you a head start to make your own or order online. Enjoy your stay in your tiny house and remember to make yourself open to new ideas. Who knows what more storage ideas are to come!